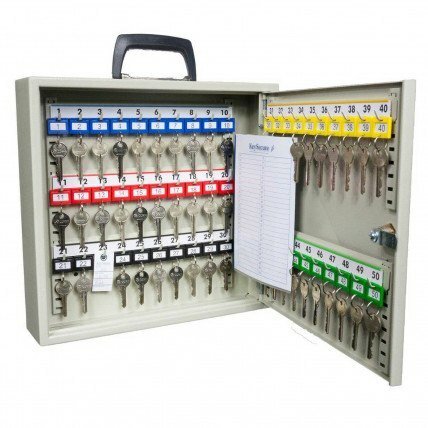 Key storage is necessary in most businesses, especially those involved with vehicle keys and property keys. 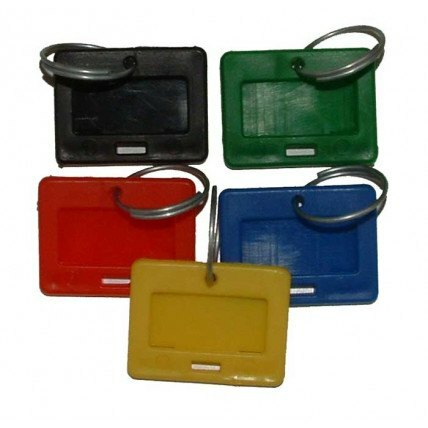 Whether you are a Car dealer or an Estate agent Safe Options has a solution to secure and store any quantity of keys from 1 up to 3000 with various levels of security. 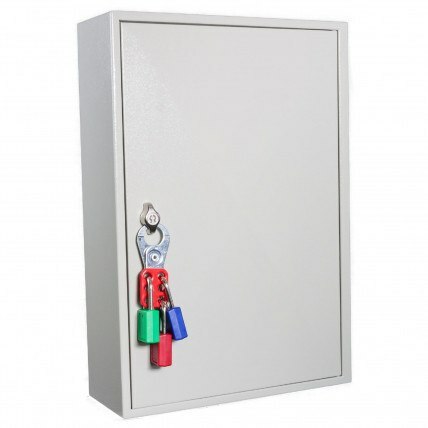 Furthermore we can offer Slam shut doors that close automatically, extra deep cabinets to store large bunches of keys or even outdoor key safes to ensure that single key for the home is always there when you really need it. 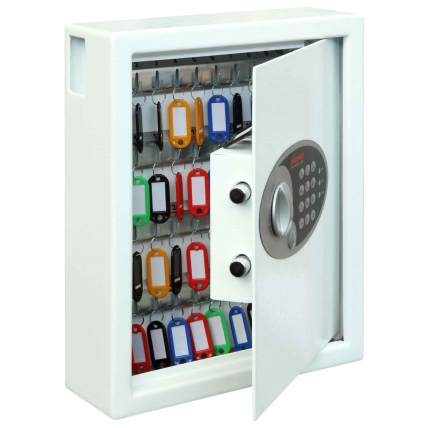 Key safes are used in a variety of businesses from car showrooms to estate agents, as well as in the home. 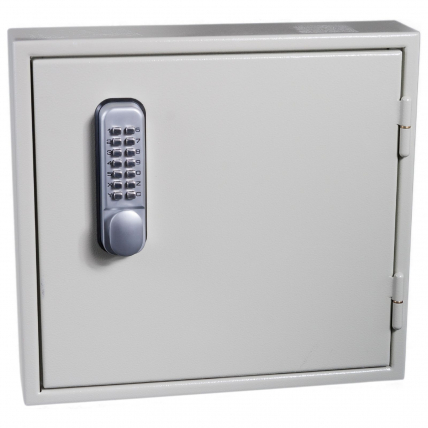 Safe Options stock a number of key safes to suit both your security requirements and your budget, so why not take a look at what we have to offer? Here at Safe Options, we've put together this information containing all of the most frequently asked questions about key safes that we receive. So if you do have some queries about key storage, read on to find out more. 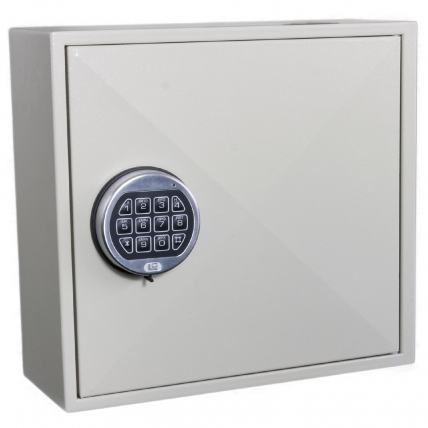 Key safes are available in a variety of different models in several price brackets. 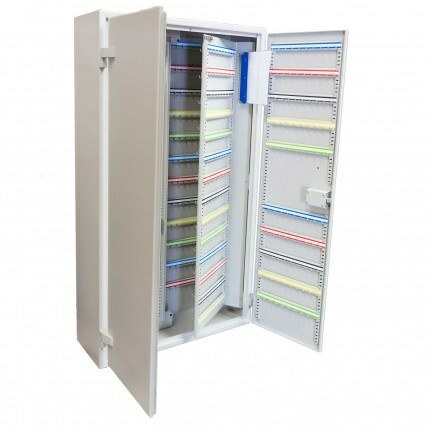 They range from mild steel cabinets to more expensive, high-end designs featuring electronic locks and reinforced walls. It is definitely a case of 'you get what you pay for' in this respect and you should balance the level of security you require against your budget. How can I change a key safe number? There are generally three types of combination lock key safes: digital electronic, mechanical push button and dial combination lock. 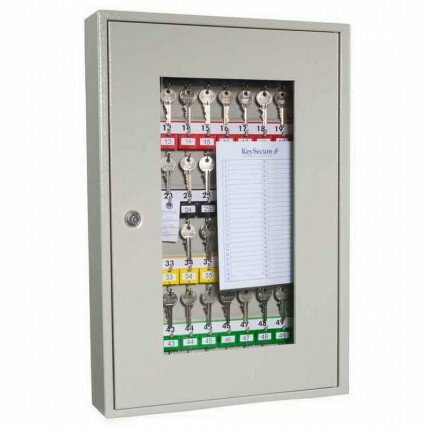 The latter type allows combination numbers to be reset by using the lever inside the safe. This will put it into reset mode, allowing you to turn the dials to input a new number. With mechanical push button locks, resetting requires you to press down on the “Clear” button, half-turn the handle to open the lid and reveal the tamper-proof panel covering the reset mechanism. Once you've removed it, you’ll find a list of letters and numbers. Using the plastic tool provided, select your new combination by twisting a grooved arrow next to each letter and number. Digital Electronic locks are the quickest to change abnd the high end versions offer extra facilities such as multi-user codes, audit control to monitor who has opened the door and at what time, time delay and time lock facilities. The idea here is to strike a balance between your budget and increased security. Generally the more you spend on a safe, the more secure it will be. Ideally you should choose a safe that meets the security level you require and then spend as much as you can afford. 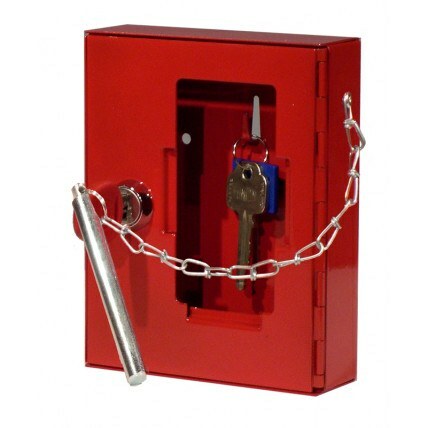 Make sure that this safe has the insurance rating that your keys require. For instance in a car rental office you may need a lower security cabinet for day use, but then place the vehicle keys in a secure safe overnight. What are the benefits of having a keysafe box for families and carers? A mini keysafe box has several benefits. For a start, it is a central point for families and carers to access a door key to the property and/or rooms. 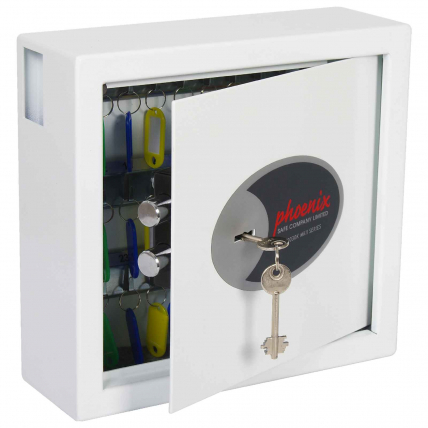 The box provides a secure place for the keys to be stored in one place. Weather resistant and easy-to-install, the keybox's straight-forward design is easy to operate by the elderly or infirm. 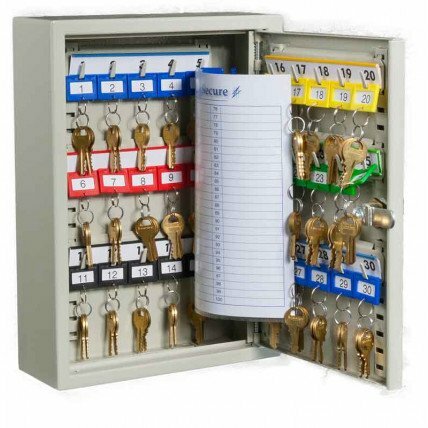 The outdoor key box is pretty secure, but if it is fixed in an inconspicuous position it can offer a safe haven for your key. Position behind shrubbery or somewhere out of site. Remember a key safe is designed, as with all safes, to resist access and will delay a burglar long enough to leave it alone. What is the most secure key safe? 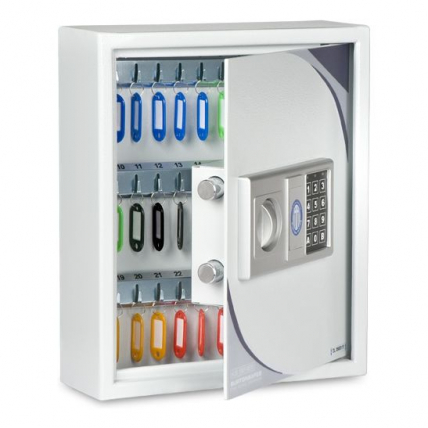 The most secure key safe is a high-security key safe. 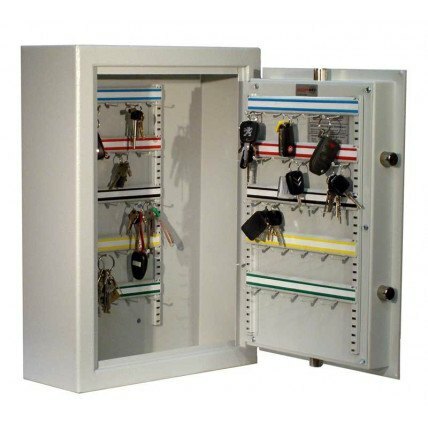 These high-end safes are wall mounted and include high security steel bolts and vds approved key locks or top quality reprogrammable digital electronic locks. 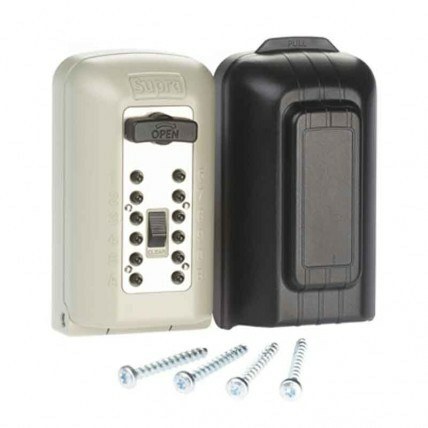 Recommended by leading insurance companies, these safes are designed to provide the ultimate means of securing valuable keys for property and vehicles. How can I disguise an outdoor key safe? Placing a key safe in a concealed location is a more secure option than simply leaving it in plain view. Ensure that the safe is placed discreetly, hidden in foliage outside or in a cupboard inside, for example. It should be placed somewhere where passers-by are unlikely to notice it as they walk by. Additionally, they should not be able to see you taking or replacing the key. Finally, you could go one step further by buying a 'disguised' key safe, usually in the shape of a gnome or a rock to fool potential thieves. How to fit a key safe? To fit a key safe to an exterior wall, you will need a power drill, a masonry drill bit, a pencil and a tape measure. If the manufacturers have supplied a template, use this to mark out the holes, if not, use the safe itself. Position the template or safe over bricks, not mortar. Mark hole locations with the pencil. Drill holes with the power drill, using the hammer setting if possible. Push in rawl-plugs if required and screw the safe to the wall. Where to place a key cabinet? 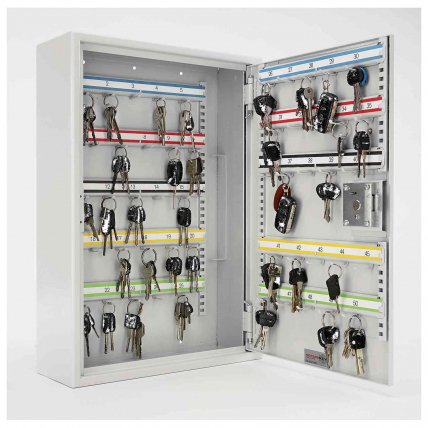 Key cabinets are used by estate agents, garages, vehicle rental companies, hotels and offices, amongst others. As these cabinets will contain keys to vehicles, properties and offices, they will need to be positioned out of public view. 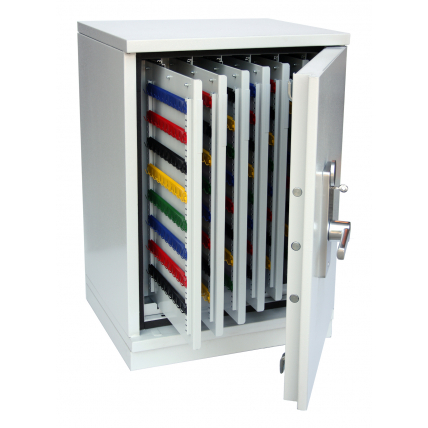 In most cases, a key cabinet will be fixed securely to a solid wall and placed in a back office accessible only to staff. I have another question about key storage. Can you assist? If you do have another question, don't be afraid to get in contact with us. Give us a call on 0800 567 7549 or email us. Our experienced and knowledgeable staff will be only too happy to answer your query.